Hearty, Healthy Winter Recipes: Yes, You Can Have Both! Get the nutrition and the comfort you’re craving with these healthy, hearty recipes. In the cold winter months we have a tendency to fall back on hearty, warm, comfort foods. During these long, dark, winter months, few things feel as comforting as a piping hot stew or a rich, steaming casserole. But these foods are often full of fats, carbs, and starches, and relatively few fresh vegetables. They sit heavy in our stomachs (and that can feel good at first) and over time the pounds pack on. The lack of fresh produce in our diets can also make us feel tired and sluggish. But don’t worry, hearty and healthy winter recipes do exist! Check out our ideas for healthy winter meals that will leave you feeling comforted, but not weighed down. Few things say comfort food the way a heaping bowl of chili does. But with fatty ground beef and lots of high-sodium canned beans and vegetables, traditional chili recipes aren’t always the healthiest. This healthy chili recipe is brightened by the inclusion of the seasonal vegetable, butternut squash. The squash not only adds color and flavor, but is packed full of nutrition. Instead of the usual ground beef, turkey is substituted to provide a lower fat option. 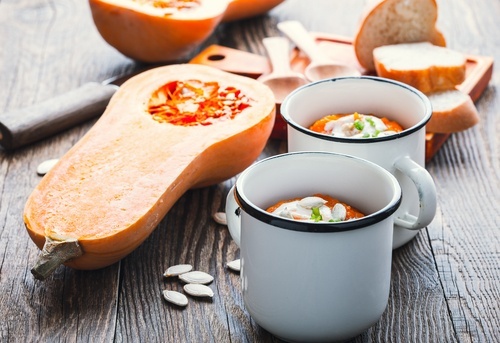 Sticking with the squash theme: try this rich, flavorful soup. This healthy winter meal is delicious and is packed with healthy ingredients to keep you energized and feeling fresh. Pair it with a hearty whole grain bread to round out the meal. You probably didn’t expect to see this one on the list! Traditional mac & cheese is loaded with calories, carbs, and cheesy goodness. This delicious spin on the recipe lightens of the first two, while keeping the third–the cheesy goodness. A layer of spinach in the middle sneaks in a bit of green that even picky eaters won’t mind. This hearty winter recipe is packed with flavor and nutrition, but keeps things light. A complete meal with protein, grains, and vegetables all in one. Make up to two days in advance and keep it in the refrigerator until ready to use. For more ideas on how to stay healthy and feeling good during the winter months, check out our blog! Or contact us for more information.